Never Lose a Lead or Client again because of misplaced information, hard drive crash, corrupted spreadsheet or a tipped over file cabinet. 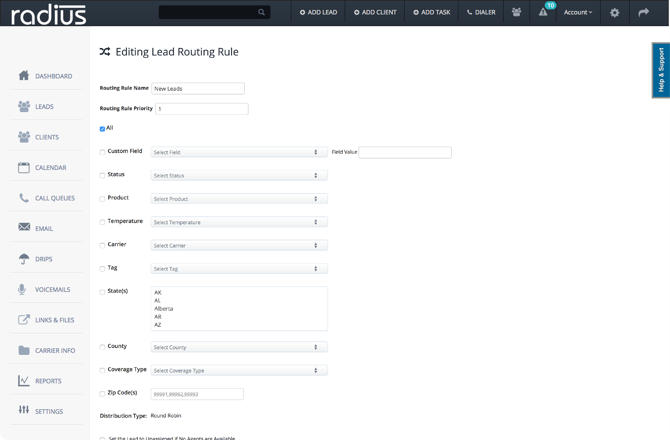 Organize and Manage all of your Leads & Clients with Radius. An all-in-one Solution for your Agency. 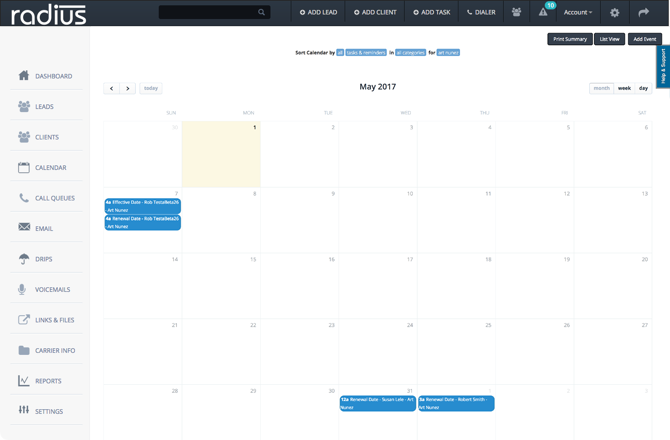 No need for a separate email marketing software, use Radius to send Auto Responders, Drip Marketing, Mass Emails & SMS/Text Messages. Every Radius Lead & Client has its own history, reminders & tasks, notes, information, and file storage. Also using the Radius Dropbox helps keep your organized by automatically importing emails. Integrate Radius with how you do Business. 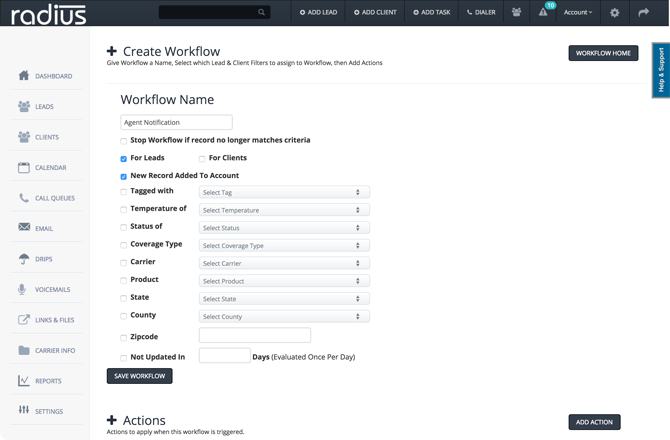 Define Custom Form Fields, Lead Temperatures, Client Status and more. Ingrate Radius with your website, quote engine, lead vendor or third party app. While nothing should ever be a ‘set it and forget it’, Radius has come as close as you’ll ever want to be in having a software solution managing the heavy lifting. Leaving you and your team more time to write business. As soon as a Lead comes into Radius, Marketing Automation kicks in with an Auto Responder being sent, email Drip Campaign is trigger, text messages are sent and more with the click of a button. Built in Telephony solution allows insurance agents to call leads and clients directly from Radius. No additional software needed. 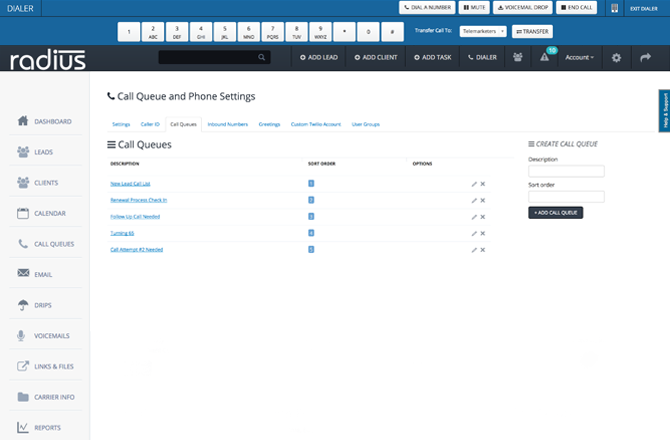 Make and receive calls just like any Call Center. Start a 15 day free trial with any plan today, start seeing Radiusbob’s value tomorrow. Unlimited users? You Need Radius π! Is radiusbob for insurance agents? Is radiusbob good for small, medium & large sized agencies? Is radiusbob support included in the price? Does radiusbob track commissions & renewals? Does radiusbob track effective & renewal dates? Does radiusbob have a calendar? Does radiusbob help me with tasks & reminders? 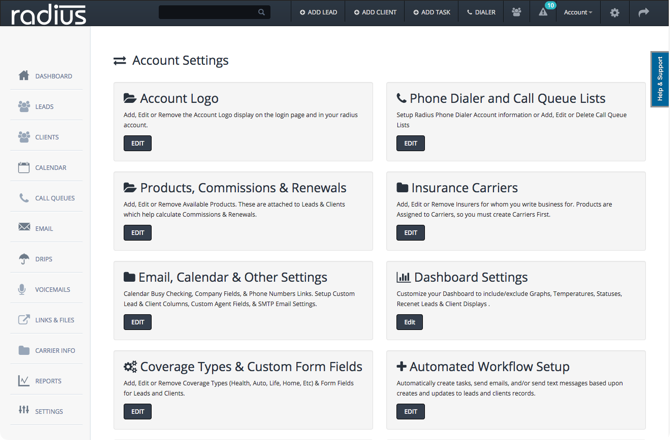 Does radiusbob include drip marketing, auto responders & email markeing? Can radiusbob auto assign leads to agents? Can radiusbob manage my leads & clients? Can radiusbob downgrade, upgrade or cancel at any time? Will radiusbob work on a mac? Will radiusbob integrate with my website? Will radiusbob store documents for our agents? Will radiusbob send text messages? Will radiusbob send me email reminders? Will radiusbob import from lead vendors? No Contracts! No Long Term Comittments! Your Radius subscription is paid on a monthly basis. Cancel at anytime (we hope you don't) with no cancellation fees. Yes. From day one, Radius implemented industry standard policy and procedures to protect your data. Plus all plans include SSL Encryption & Strong Password Requirements. Can we export our data at any time? Yes. Within your account under the Admin Settings two buttons allow you to export all your lead and client information whenever you want it. No Charge. Radius currently accepts Visa, Mastercard, Discover and American Express. Once your information is in the system, billing is automated on a monthly basis. We'll send you an email prior to each months transaction and then we'll follow that up with a confirmation email which includes your reciept. Is a Credit Card required for the 15-Day Free Trial? No, not at all...The only time you need to enter your Credit Card is before the Free Trial ends if you would like to activate your Radius Account. Does the 15-Day Free Trial Include Everything? Almost, there are only three features you cannot use during the Free Trial, Sending SMS/Text Messages & Emails and Click-to-Call Outbound Calls. Yes. During your Free Trial you can import your data using our .CSV Template, Import Mapping Feature and Knowledge Based Articles on Importing. Once you become a Paid Subsciber, we'll work with your data file and account directly to make sure everything runs smoothly. What Happens after the 15-Day Free Trial? Two things; either you update your billig information and become a paid subscriber or you don't and your account is canceled automatically. It's that simple. Radius helps us manage both our Individual Health Business and our Medicare Business in one system. Hundreds of agents working leads. We customized Radius to help us manage a large book of business making sure no client renewals were missed and commissions lost for our agency. Our customized version of Radius keeps our Telemarkerters on point generating leads and our Agents on point for working those leads. MedicareCompare is where our agents live on a daily basis. Marketing money spend on generated leads never go to waste with Radius.